Restaurants often score big in sales on Super Bowl Sunday, but it’s not without effort. As the New England Patriots and the Los Angeles Rams prepare to face off in Super Bowl LIII in Atlanta this Sunday, restaurant operators and retailers shared statistics around the annual National Football League title event. 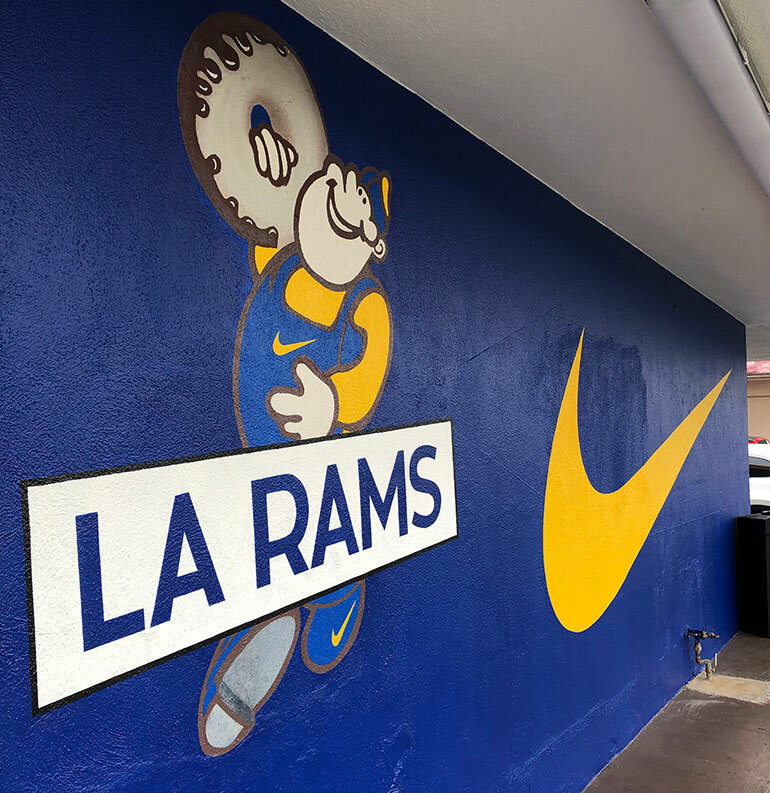 days of nearly around-the-clock painting were required to turn the iconic doughnut atop Randy’s Donuts in Los Angeles into a Rams confection, said spokesman Thomas Bartsch. The painting, sponsored by Nike, was completed Tuesday evening, after starting the prior Saturday. will be spent on average this year by American adults — on food, drinks and other products — as they watch Sunday’s game, according to an annual survey by the National Retail Federation and Prosper Insights & Analytics. “The average spending is virtually unchanged from last year’s $81.17, and is the second-highest in the history of the survey after a record of $82.19 set in 2016,” the NRF said. will be forked over by the biggest-spending demographic — American adults 35-44 — according the NRF survey. The lowest payout is expected from those 65 and older, who are projected to spend $40.97. of those planning to watch the game plan to buy food and beverages during the game, the NRF report noted. hours before kickoff, restaurant food orders begin to increase in volume, according to a survey by Punchh, a digital marketing solutions company. Orders then slowly taper off during the game, the company added. million pizzas will be ordered on Super Bowl Sunday, according to the American Pizza Community. Chicken wings were sold on Super Bowl Sunday last year at locations of Dallas-based Twin Peaks restaurants, which saw more than 40,000 customer fans that day. draft beers were sold at Twin Peaks last year — and 10 percent of guests ordered a Fireball shot. television screens can be tuned to the game at the more than 1,200 restaurants of Atlanta-based Buffalo Wild Wings. million traditional and boneless wings were sold last year at Buffalo Wild Wings. The most popular sauce for those finger foods, according to the company: Honey BBQ. units of Plano, Texas-based Pizza Hut will deliver beer on Super Bowl Sunday. The service was recently expanded and is now available in seven states, including: Arizona, California, Florida, Iowa, Nebraska, North Carolina and Ohio.